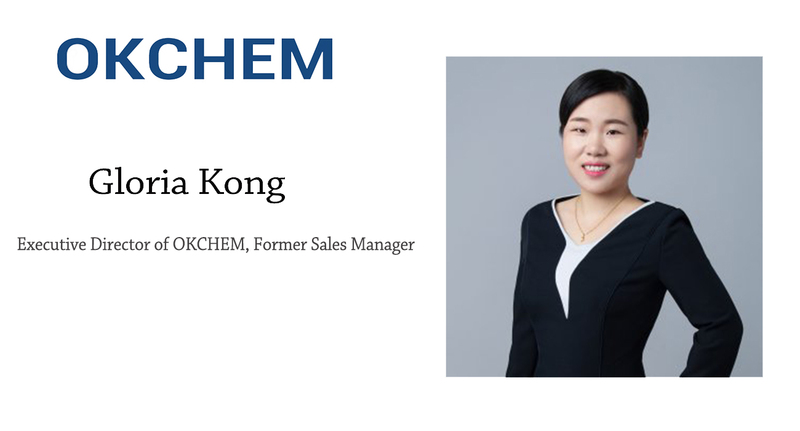 Gloria Kong is dedicated in international chemical business for more than 10 years, started as a salesperson and now the Executive Director of OKCHEM. She believes in customer-oriented business model and always has fast responses to customers. If customers ask for a product, no matter it is an existing one in the business line or completely new product, she could finish the research within one day. And send customer a professional product portfolio, including specification, price and package details. Late 2012, a customer asked about chemicals for liquid paper dyes production. This was a new product to OKCHEM and we didn’t have any other information or reference. And It usually takes time to source, screen suppliers and build up the product base. However, Ms. Kong found competitive suppliers and made a completed set of products in one day. It would take several days for other salesmen to accomplish this task. At the same time, she asked the manufacturer for samples, had laboratory prepared cloth swatch. And then made to a professional color chart brochure, sent to the customer within one week. The customer was deeply impressed by her pro-active services. In other cases, if she can't complete product inquiries at the same day, she would give timely feedback to customers, and keep customers posted about the time-frame and process. Ms. Kong got a lot of unanimous praises for her work efficiency and responsiveness. Ms. Kong’s success lies in the customer-oriented services, which means that value-added services is the paramount factor and customers’ requirements shall be timely, correctly and consistently met.